What are digital competencies for the future? What is the impact of digital media and technology on children and its implication to national and global society? What are effective ways to provide safe and creative digital education eco-system for all children around the world? DQ Institute adopts an evidence-based and data-based approach. DQ metrics were developed through data analytic research through multi-national studies based on a multi-disciplinary approach. We invite researchers, educators, and organizations around the world to tackle these issues to be part of our DQ Research Network. In 2018, the #DQEveryChild movement spearheaded by the DQ Institute in association with the World Economic Forum superseded all expectations and continues to make impact around the world.  On Safer Internet Day (6th February 2018), the 2018 DQ Impact Report was published in association with the World Economic Forum. As part of our #DQEveryChild movement to empower children with digital intelligence (DQ), the multinational report delved into the current state of online safety and digital citizenship among 38,000 8-12 year olds across 29 countries. In particular, we focused on how children became exposed to cyber-risks and how these risks may affect them. Our key finding, that 56% of 8-12 year olds are exposed to at least one cyber-risk (including risks like cyberbullying and online grooming), is particularly revealing of the work that lies ahead for all of us in the creation of an ethical digital ecosystem for this generation of digital natives. In the 2016 DQ Pilot Impact Study, about 60% of children who were exposed to cyber-victimization wanted extra help to handle their cyber issues. A 2015 DQ e-counselling study conducted by the National Institute of Education, Singapore also revealed that timely intervention is critical to improve emotional well-being of children who are exposed to cyber-risks. From September 2017, DQWorld.netTM will include a unique help-reporting system to detect a child’s exposure to various cyber-risks and provide opportunities to proactively intervene to help at-risk child. A 2017 DQ online counselling study conducted by the National Institute of Education (NIE), Singapore revealed that lack of nonverbal cues enhanced children’s psychological safety and willingness to self-disclose online. TCPs also found it helpful to use a solution-focused approach to work with children and to adapt their face-to-face counselling techniques to online counselling through the use of SITCOMS (Skills in Text-based Communication). A 2018 DQ e-counselling study also conducted by NIE revealed that online counselling helped children find solutions as well as support for their emotional and practical needs. The DQ online education program was developed through a collaboration between Nanyang Technological University and infollutionZERO with support from the Inter-Ministry of Cyber Wellness Steering Committee and Singtel in Singapore. The 2016 Singapore DQ Pilot Impact Study involved 2218 8-12 year old children and was successfully conducted to understand the efficacy and impact of the DQ online program to enhance children’s DQ skills and improve their attitudes and behaviors against cyber risks. The results were highlighted at the 2017 World Economic Forum Annual Meeting that was held in Davos, Switzerland found here. By increasing the DQ Score, DQ World minimises risky behaviours online and maximises future-ready skills including critical thinking and empathy of children aged 8–12. Higher parental and teacher engagement – through active facilitation and performance tracking – achieved greater improvements in DQ. 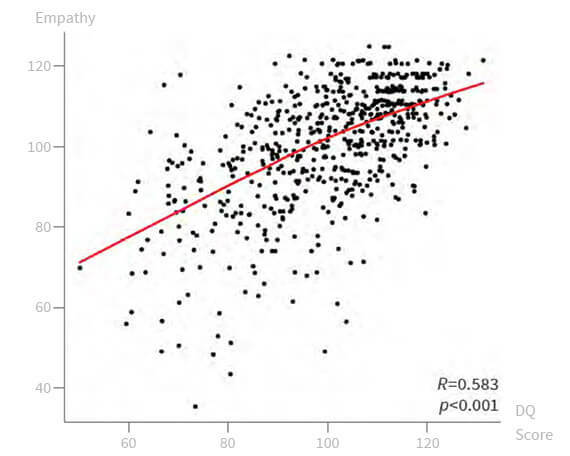 Highly significant correlation (R=0.583, p-value <0.001) between DQ score and empathy. 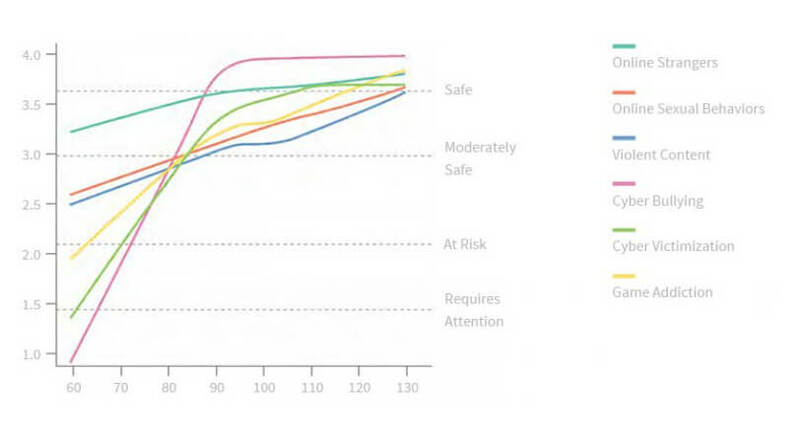 Note: DQ Score in this graph is the average of the scores of digital citizen identity, screen time management, cyber bullying management, cyber security management, critical thinking, digital footprint management and privacy management. 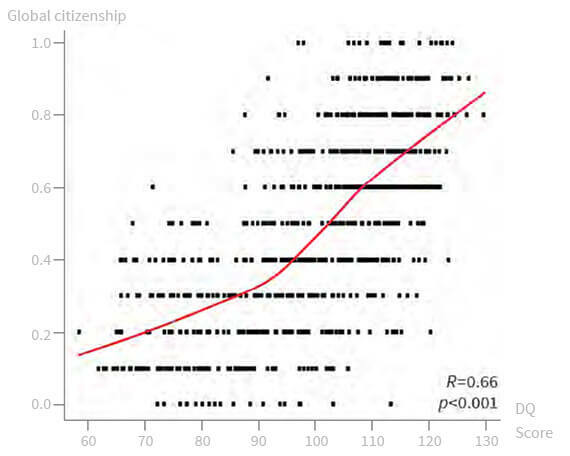 Highly significant correlation (R=0.619,p-value<0.001) between DQ score and global citizenship. 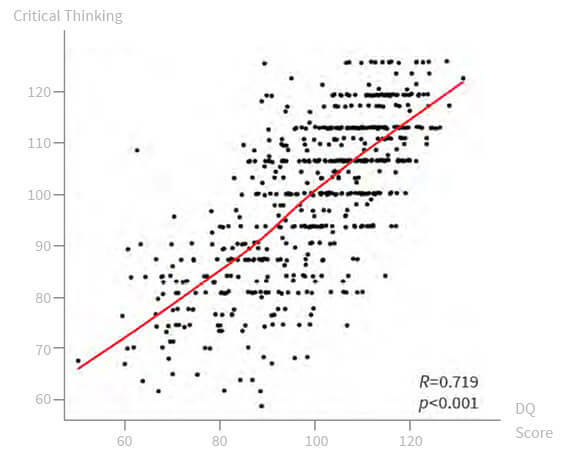 Highly signficant correlation (R=0.719,p-value<0.001) between DQ and critical thinking skills. 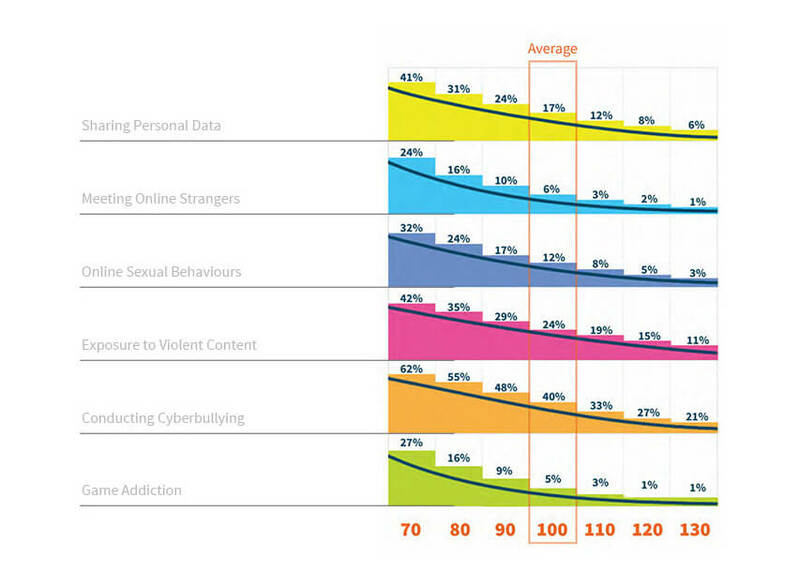 Note: DQ Score in this graph is the average of the scores of digital citizen identity, screen time management, cyber bullying management, cyber security management, digital empathy, digital footprint management and privacy management. DQ World is an innovative research-based, e-learning platform that is specifically designed for young users of digital media and technology. The online educational platform has been recognized by two UNESCO awards for its pioneering efforts to promote digital citizenship education among children. DQ World’s approach is pioneering in the sense that it has transformed how nations approach digital education. Indeed, more and more school programs are incorporating technology in a variety of ways: some use computers in the classroom, some make online assistance available to children, and some teach coding and even robotics. Basic digital citizenship skills, however, are often overlooked by educators and parents despite being fundamental to a person’s ability to get the most out of technology and to avoid risks. One reason for this gap is that teachers themselves have not been trained in the area of digital citizenship education, and they are already over-burdened with other teaching needs and requirements. Therefore, any comprehensive program needs to either (1) include training for teachers and fit in within the curriculum, or (2) provide training directly to students with only basic support needed from teachers. DQ World is based on this second approach, and is a compatible with a wide variety of learning environments. Jointly developed with top institutions including Nanyang Technological University, DQ World is a world leading online education platform to teach children ages 8-12 the 8 Digital Citizenship Skills. It empowers them to become informed and discerning digital citizens. Visit DQ World at https://www.dqworld.net today! This article published in Nature Outlook on October 2018 outlines exactly how DQ can help address the need for digital intelligence. We are living in a renaissance period of new digital media and technologies that are reshaping the world around us. A wide and growing cross-section of the world’s population has become immersed in this hyper-connected digital world, in turn transforming the ways we communicate and interact. At the same time, as digital media and technology become an indispensable part of our daily lives, there is growing concern that we are losing control as our dependence on technology grows. Digital issues caused by this 24/7 hyper-connected culture –including technology addiction, cyberbullying, online sexual behaviors, cybercrimes, online privacy concerns – are proliferating and significantly impact daily life. As such, there is a global imperative to empower children to become good digital citizens who are smart and responsible users of technology – avoiding harmful and risky activities while maximizing the benefits of technology use. In order to address this urgent need, the Digital Intelligence concept was developed. Digital intelligence or “DQ” is a set of skills needed to meet the demands and challenges of the digital world, including digital citizenship and literacy skills. With a global DQ standard, there is now a way to assess the digital intelligence quotient of children across the world. The Global DQ Index Report publishes the Global DQ Index. As the established standard for digital intelligence, DQ will be measured and tracked globally, and published in collaboration with the World Economic Forum annually. The first report will be released in 2019. The DQ National Report assesses the national DQ Score of 8-12 year old children. It aims to report general findings and provide evidence-based recommendations to advance national policies on digital education and online safety for children. If you are interested in obtaining DQ National Reports for your county, please contact us.